FEATURES: With 2 USA outlets and 2 USBs (2.4A) Perfect for Travel. To be used with Cell Phones, Laptops & other devices. Use any where in the world - except a few countries listed Below. Surge Protection - Safe High Quality Device - Comes with a Travel Pouch - Ultra compact size - Dimension 2.75" x 3.75" x 1.5" . Very light weight - less than 5 ounces. Accepts plugs from all countries including USA, DOES Not South Africa Plugs Accept Plugs. Ungrounded Round Prong plug. Max Capacity Up to 3000 Watt (max 250 Volt, 13 A). Accepts 4 Devices, 1 Grounded Outlet and 1 Ungrounded Outlet, 2 USB Input Total 2.1A Amp. ALL IN ONE DESIGN: Trip power multiple sockets have 4 types of plugs and dual USB charging ports. Little size and easy carry, when you go travel and see the world, you only need to take this one. HIGH COMPATIBILITY: The world adapter is compatible with most devices in market, such as Apple iPhone, Samsung, Sony, HUAWEI, LG, Tablets, Laptop, and almost all digital devices. The Ceptics Travel Plug Adapter is a small pocket-sized power adapter for go-anywhere convenience. The Ceptics UP-9KU is easy to use, with slide-out power plugs that ensure you won't lose any vital pieces, in a compact, self-contained unit that eliminates any hassles. Inspection does not always include powering up devices, if applicable, and ensuring they operate as intended. At 110V,1440W Max. CHARGING FAST: Compact and Powerful universal power adapter multi-Plug provide fast, safe and efficient charging for all your devices. USB Output: 5.0Vdc, 2100mA Max.It can be used over 150 countries. Input:110-240V, Output: 5V, 6V, 7.5V, 9V, 12V, 13.5V, 15V, Max 36W [Choose Correct Voltage before Powering] Small household appliances usually don't have circuit protection, if with the wrong voltage, may damage your device. It is important to choose the right voltage before powering your device [IMPORTANT] DC Plug Polarity:Central Positive( ), outer Negative(-). Polarity could not be reversed. Some devices require Central Negative (-) and outer positive ( ), which is totally opposite and not fitting, please check carefully before buying. Any using issues, please contact us before return. We always stand behind DC Plug Dimensions: 5.5x2.5mm, 5.5x2.1mm, 4.0x1.7mm, 3.5x1.35mm, 2.5x0.7mm, 3.0x1.0mm, 5.5*2.1mm coverter plug for LED strips or other DIY. The difference between 1A USB charging port and 2.1A USB charging port：Normally, most phones use 1A., tablets 2.1A. However, the device will only draw a current that it needs. Slide the "lock/unlock" button to the "unlock" side in order to allow the arms that go into the wall to pop out. Double Fuse: There is a fuse that could protect your devices does not be overloaded,the another fuse can replace. at 110V,1440W Max. What you need isuniversal world travel adapter. USB Output: 5.0Vdc, 2100mA Max.It can be used over 150 countries. RockStone Power proudly supports the United States Military since 2001. Rockstone Power?. Size: 1000 Watt. Certification: Energy Star Certified. 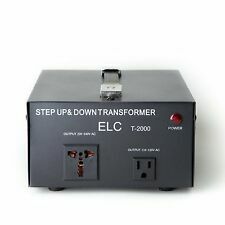 $Key Features ---ELC series of step up/down voltage transformers ---NOTE: This converter is designed only for European/Asian 220V (Single Phase) , it will not Work with American 220 (Dual Phase) ---Up to 2000 Watt Maximum Capacity ---Heavy Duty Step Up/Down Voltage Converter Transformer ---Converts/Transform Voltage 110/120V to/from 220/240V ---Dual Circuit Breakers Protection for Each Voltage (120V & 220V) ---1 x 110V Socket | 1 x Universal 220V Socket ---* Efficiency Factor: 1.50 ---Weight: 12.5 lbs ---Dimensions: 10.25" x 8.0" x 4.5" ---CE Certified ---Use for use & industrial applications. ---Heavy-duty cord with a standard US 3-prong plug. ---220 volt only universal outlet which accepts plugs from most countries. $Key Features ---US Patented Universal Input: Accepts plugs from all countries (except the Type M - big S. Africa 8.7mm Plug) ---Designed with double ports (receptacles) allow you to plug-in two electrical devices (connectors) at once (does not convert voltage) USB input ---Surge Protection with smart LED input voltage indicator (110V or 220V) - protect your high end electronics from harmful voltage surges ---Output: "Type E/F" Suitable for Germany, France and more. ---Recharge your USB devices (cameras, cell phones, PDA, MP3 players, GPS devices and much more) in your home, office, hotel, etc. USB LED light indicates charging status - Fully Charged: Green Light, Charging: Red Light, USB: MAX 1A ---Note: Plug adapters do not convert voltage, they just change the plug type. With an 8 hole universal input socket compatible with every international standard 2 and 3 prong plug. Travel Adapter, Worldwide All in One Universal Travel Adaptor Power Converters Wall AC Power Plug Adapter Power Plug Wall Charger with Dual USB Charging Ports for USA EU UK AUS Cell phone laptop. Spare Fuse & Travel Pouch Included. AU Type - Australia, China (Twist with fingers to convert USA plug into AUST plug). ★SAFETY PROTECTION FROM BLUEGOGO - Built-in Fuse protect / Built-in Safety Shutters / LED Power Indicator and an 12-Month Warranty. Feature: This Travel Adapter is suitable for use with most 2-pole plugs. It is the safest way to plug in your portable, non-grounded devices around the world. 100-240Vac (660W max. at 110Vac. 1380W max. ). Compact size(6×3×1.57 in) with a drawstring travel bag,A MUST HAVE for your trip. 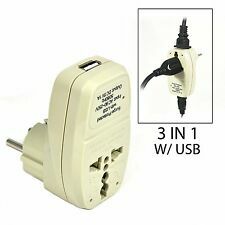 3 x Travel Adapter(Type G/D/M/AU/US). Portable and Universal: Compact size(6×3×1.57 in) with 5 international travel adapters (Type G/D/M/AU/US),powering your devices in more than 160 countries,EASY YOUR TRIP! The Ceptics Travel Plug Adapter is a small pocket-sized power adapter for go-anywhere convenience. The Ceptics USB-4D is easy to use, with slide-out power plugs that ensure you won't lose any vital pieces, in a compact, self-contained unit that eliminates any hassles. ADVANCED TECHNOLOGY - Built-in Fuse protect / Built-in Safety Shutters / LED Power Indicator. The universal socket design featured in the GP series adapter is capable of accepting plug from almost any country around the world. It accepts ground / ungrounded and polarized / unpolarized plug from countries including USA, UK, India, Italy, Australia, China and many more.
" I recently traveled to Australia from the US and needed a Plug Adapter Power Universal to use my existing devices there. Plug Adapter Power Universal is by far the one I love the most". Plug Adapter Power Universal hasHIGH COMPATIBILITY, is compatible with most devices in market, such as Apple iPhone, Samsung, Sony, HUAWEI, LG, Tablets, Laptop, ect. Rated at 10A / 250V and 15A / 125V. Model: 4330187038. BESTEK Universal Travel Adapter 220V to 110V Voltage Converter with 6A 4-Port. Condition is New. Shipped with USPS Priority Mail Small Flat Rate Box. 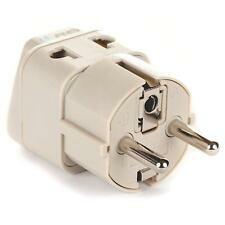 Sharper Image World Travel Universal Adapter Plug New For Tablet/games/shaver $$. Condition is New. Shipped with USPS First Class Package. And 4-USB Ports can work with all DC 5V usb devices. As long as your device is “input 100-240v”, below 10A, do use adapter socket for them. While used in 110/120V countries like US,CA, it can load 1100Watts in total. Manufacturer: SAUNORCH. [MultiProtect Safety System]: As a Global Universal Travel Adapter, Qualified with FCC CE and RoHS Certified safety system, made from durable polycarbonate shell and thermal protection layers, built-in 6.3 Amp fuse and safety shutter design, ensures complete protection for you and your devices. All-in-one Worldwide Travel Adapter with Built in Surge Protector Universal Adapter with 4 USB Charging Ports. Over current protection: The global travel adapter will be auto recovered after over current faults are removed.